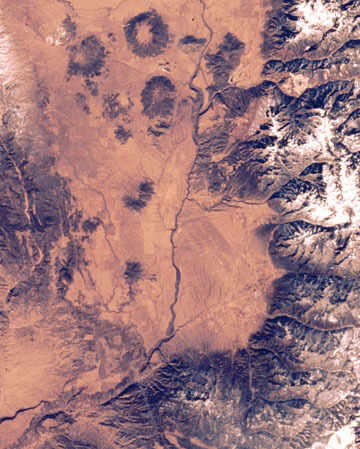 The Taos Valley as seen from the Space Shuttle in 1999. Click the image to see a geological map of this area. Taos is located at the edge of two strikingly different landscapes. To the west stretches the Taos Plateau, level except for some low hills and the deep gorge of the Rio Grande. To the east towers the Taos Range of the Sangre de Cristo Mountains. To the south, the Picuris Mountains extend westward as a prong of the Sangre de Cristo Mountains. The boundary between plains and mountains is abrupt, in places defined by high, near vertical cliffs. The Taos region exhibits a spectacular combination of geologic features, including mountains, valleys, and volcanoes that attest to a long and complex geologic history. The Taos landscape has changed dramatically during the last two billion years as the continents have drifted over the globe, occasionally colliding in orogenic splendor. Among past Taos landscapes are mighty Precambrian mountain belts, shallow tropical seas, vast sand-duned deserts, extensive white sand beaches, and muddy meandering rivers bordered by lush fern forests. Most recently, the Rio Grande valley and its youthful volcanoes attest to an Earth history punctuated by violent earthquakes and volcanic eruptions." 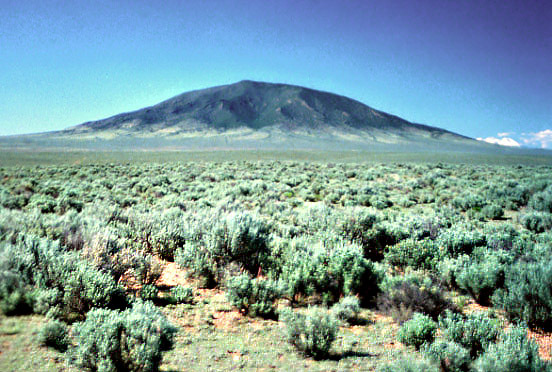 Ute Mountain NW of Taos is a Tertiary (Pliocene) rhyodacite stratovolcano.